Sweden’s Mattias Ekstrom has won this weekend’s World RX of Great Britain, his third back-to-back victory in the 2016 FIA World Rallycross Championship presented by Monster Energy. Reigning Champion Petter Solberg took the runner-up spot, while Team Peugeot-Hansen driver Timmy Hansen clinched third. In the overall drivers’ standings after four rounds, Ekstrom leads Solberg by five points. Ekstrom – who drives an Audi S1 EKS RX quattro for EKS – was placed fourth after Q4, the Swede having suffered from a puncture and a small engine problem. 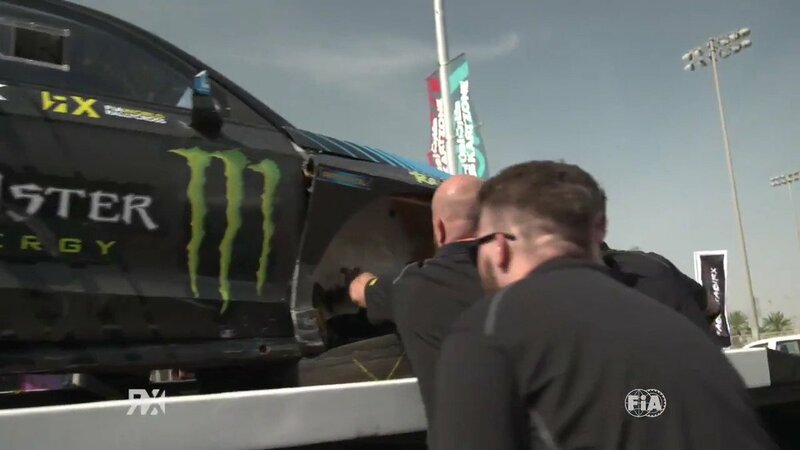 He fought back, however, to win his semi-final and a clever use of tyre strategy saw him fastest off the line in today’s final – which also awarded Ekstrom with the coveted Monster Energy Super Charge Award. Hansen’s younger brother Kevin finished fourth overall – a remarkable achievement for the talented Swede who celebrated his 18th birthday over the weekend. Fifth place was taken by Russia’s Timur Timerzyanov – the best result for the World RX Team Austria driver since Italy last year. Hoonigan Racing Division’s Andreas Bakkerud was second at the Intermediate Classification stage but was denied a podium spot due to technical problem with the car – he eventually finished sixth. Topi Heikkinen was seventh for EKS. EKS remains top of the teams’ standings after round four – 56 points ahead of Team Peugeot-Hansen who are second. Team Volkswagen Sweden’s Johan Kristoffersson finished eighth at Lydden Hill, unable to reach the final due to a puncture. Kevin Eriksson [Olsbergs MSE] and nine-time World Rally Champion Sebastien Loeb were ninth and tenth respectively. France’s Davy Jeanney narrowly missed out on a place in the semi-finals finishing 13th. America’s Tanner Foust didn’t race in either of the two qualifying races on day two due to technical issues with his Volkswagen Polo. Home favourite Liam Doran had hopes of making today’s semi-finals but was hampered by a puncture in Q1 and struggled with engine problems. In the third round of the RX Lites Cup, it was Frenchman Cyril Raymond who took the overall victory. Thomas Bryntesson finished second, the Norwegian making a spectacular comeback after starting on the back row of today’s final. Simon Olofsson was third. In the overall RX Lites standings, Raymond leads – three points ahead of Bryntesson, who won the first two rounds. In the Super1600 Championship, where Lydden Hill formed the second round of the support category, it was Hungary’s Krisztian Szabo who took a lights-to-flag victory in his Skoda Fabia. Artis Baumanis and Josef Susta finished second and third respectively. Szabo leads the S1600 crews after two rounds, eight points ahead of Denmark’s Ulrik Linnemann. The fifth round of World RX takes place at Hell in Norway in two weeks’ time (10-12 June).